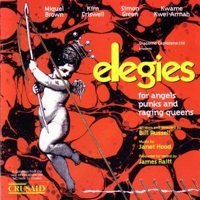 New York Concert Cast, 2001 (Fynsworth Alley) (5 / 5) This is a live recording of a concert version of Elegies…. that was performed as an AIDS benefit. Featuring a cast of 52, the concert was conducted by Janet Hood and directed by Bill Russell. The recording begins disappointingly with Alice Ripley’s forced rendition of “Angels, Punks and Raging Queens,” a song that wants a much more simple, less showy performance, but the rest of the singers are wonderfully well matched to the material. Brian d’Arcy James lends his gorgeous voice to “And the Rain Keeps Falling Down,” Clent Bowers and Doug Eskew offer blessed comic relief in “I Don’t Do That Anymore,” and Emily Skinner’s singing of “My Brother Lived in San Francisco” is very special. (Skinner also duets with Ripley, her erstwhile Side Show twin, in “Celebrate.”) On hand as well are such talents as Alton Fitzgerald White, Orfeh, Amy Spanger, Stephanie Pope, Kane Alexander, Kathy Brier, Sharon Wilkins, and Kelli Rabke. The album ends grandly with Norm Lewis soaring through “Learning to Let Go” as the entire company sings backup and the audience claps along. Given that this is a live recording with no touch-ups, some of the performance sounds a bit raw, but that’s entirely appropriate to the subject matter. A major selling point of the disc is that it includes six of the show’s monologues, delivered to full effect by Steve Burns, Erin Torpey, Veanne Cox, Bryan Batt, Christopher Durang, and Mario Cantone. — M.P.